Croatia’s beautiful and rugged Dalmatian coast starts in the county of Zadar. It is a historically important region, rich in archaeological and architectural legacy. Zadar is Dalmatia’s administrative and cultural centre, and an important agricultural region. Though a large portion of cultivated land was destroyed during the Homeland War, the area of Ravni Kotari and along the coast is still productive in fruit and vegetable farming and sheep breeding. The county grows olives, peaches, cherries, plums, almonds and figs. It processes alcoholic and non-alcoholic beverages. There are thriving industries in manufacturing and construction. The county has beautiful cities, including the capital, Zadar. Many hotels, apartments, camps and marinas have been rapidly built here to attract more international visitors. But despite modern attractions, Zadar remains largely rural, with almost half of the region still covered in forests and uncultivated lands. Zadar is also an important transport hub. Zadar lies on the Adriatic coast, with its city centre jutting out into the sea on a rectangular plot of land. It has been settled since ancient times, and remnants of Roman structures survive to this day, including parts of the city wall and the aqueduct. It owes most of its existing urban plan, however, to Venetian rule. The 16th century city wall and city gates still stand and some fort ruins remain. Hotels, promenades, restaurants, cafés, bars, night clubs and sports centres have altered the look of the ancient city. But many beautiful old buildings still grace this Dalmatian city. One is the circular, 9th century St Donatus Church, a fine example of Byzantine architecture and one of Zadar’s most prominent attractions. It is now also a favoured venue of classical musical and theatrical performances. One of the most unusual attractions in Zadar is the Sea Organ. A 70-metre-long flight of neat concrete steps going down to the water covers 35 organ pipes facing the sea. They emit musical tones when the wind and the waves enter them. Real estate development is on the rise as Zadar becomes more fashionable as a holiday destination. 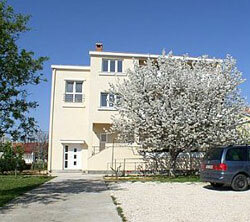 Private family villas and apartments are offered in new suburbs like Brodarica near the northeastern coast.